Feb. 7-- Viola Arlene Lee age 55 of Ailey, GA. Viola was born in Vidalia, Georgia on February 3, 1964 to the parentage of Annie Mae Lee and the late Eddie Gene Lee. Viola entered Eternal Rest on Tuesday, February 5, 2019 at Candler/St. Joseph’s Hospital in Savannah, GA.
She was known as ‘Lene’ by her family and friends that grow up with her. She graduated from Vidalia Comprehensive High School in 1982. Viola, a very caring young woman, knew the Lord at an early age and worshiped at Mt. Calvary Baptist Church. She was a member of Mt. Calvary Senior Choir and Missionary Department. She enjoyed reading and being a Godmother. She was preceded in death by her Father Eddie Gene Lee. She is survived by her Devoted Mother Annie Mae Lee. Two Brothers, Melvin Lee of Mt. Vernon, GA, and Michael Lee of Higgston, GA, and her Sister, Kimla Lee of Raleigh, NC. She has One Niece, Tiesha Gibson (Cory) of Vidalia, GA and One Great Niece, Logan Gibson. Also, she is survived by a Half-Sister, Christy Burden of Nashville, TN, and a Half-Brother Andrea Burden (Charlene) of Atlanta, GA, and a host of other loving relatives and friends. Funeral Service will be held on Saturday, February 9, 2019 at 11:00 AM from the Sanctuary of Mt. Calvary Baptist Church in Alston, GA. Rev. Lehmon Smith Pastor will deliver the eulogy. 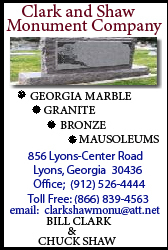 Interment will follow in Old Salem Cemetery in Alston, GA.